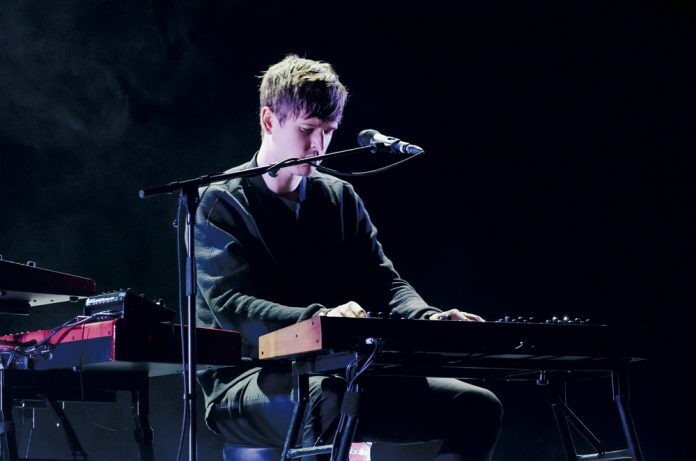 To call James Blake’s Oct. 18 show at downtown Santa Barbara’s Arlington Theatre a spectacle is almost an understatement. The London crooner’s set ranged from the understated, bedroom-on-a-rainy day electronic R&B songs that defined his self-titled 2011 debut, to newer songs that strayed closer to modern R&B over a bed of U.K. garage, drum’n’bass, dubstep, and sometimes frisson-inducing bombast. However, the Arlington show itself was a sparsely attended spectacle. As the day of the concert approached, demand was so modest that prices for second-hand tickets on Stubhub fell to a low of $6 for those eager enough to continually check the site. Even so, a large portion of his target, young adult/20-somethings audience were stranded in Isla Vista or could not afford to stay up that late in the middle of the week. Either way, a significant, tragic chunk of seats were left unfilled. Kicking off the night was Airhead, born Rob McAndrews, an electronic producer from North London who grew up alongside Blake, and collaborated with him on a 2010 split single, “Pembroke,” and the song “Knives” off his 2013 album For Years. In addition, he’s been playing guitar and keyboard as part of Blake’s touring band since at least 2011, including that night’s show. The very beginning of his set transitioned almost seamlessly from the intro playlist, a subtle show of skill with manipulating recorded music and awareness of minute sonic disturbances that commonly occur in live music. All his songs were combined into one continuous mix of immersive, sometimes grainy keyboards reminiscent of Timeless-era Goldies, over restrained UK garage with the genre’s signature ultra-tight snare sound. It’s satisfying in the same way as pressed computer keys or the clop of a hard shoe hitting the pavement. At times the set would venture into purely UK garage soundscapes, fueled by 8th note kick drums that added a clubby element, though some of keyboard lines wouldn’t have sounded out of place in a banger if they’d been produced to that effect. However, bravado would have seemed out of place in his set — he didn’t say a single word and exited the stage immediately after finishing. Instead, the performance was painstakingly focused on his music, since the seating-only Arlington didn’t have much room for dancing. It was stimulating to zone in on individual rhythmic or melodic motifs, how they appeared out of nowhere, interacted with the rest of the instrumentals, and then faded out only to be replaced by another interesting line. The end of his set transitioned perfectly into the background music, just like it began. As James Blake was about to take the stage to droning keyboards, the giant screen lurking in the back of the stage was revealed through a pulsating light that swam along it in a random motion, briefly increasing in intensity and size before returning to its former minuscule state. When Blake & co., McAndrews on guitar and Ben Assiter on drums, walked onstage, the light remained intense. The crowd roared as the band members took their seats in the three separated platforms laid out for them, and launched into “Always,” a honeyed, subdued mid-tempo track off his newest album The Colour in Anything. The lonely light in the back of the stage continued to wander, making the song feel like the forlorn melody of an isolated deep-sea submarine. Though Blake is his music’s obvious center of attention, he was positioned to the right of the drummer, like he was just another member of the band. Next on the setlist was the original version of “Life Round Here,” on which Blake famously collaborated with Chance the Rapper in an alternate version. When Blake would sing the opening lines of the chorus, “Now we’re at square one,” McAndrews would play a soaring guitar note that complemented the synths perfectly. The same spacious guitar parts crossed a line into awe-inspiring when the band embarked on a bombastic jam sesh on a lower version of the song’s signature riff. The bassy, harmonized keyboard line in “Timeless” resonated within your chest as you listened to Blake touch on echoes of old keyboard riffs and familiar chords, before commencing the song’s build-up into a dueling bubbly and squeaking, extremely infectious, synth part. Following that was “Limit to Your Love,” a Feist cover from his first album, and one of his most stripped-down songs. He played the signature, acoustic-sounding piano part, his voice reaching a diminuendo when he sang, “There’s a limit to your love/Like a waterfall in slow motion/Like a map with no ocean.” Right after, a trembling wall of bass issued out along with a threadbare beat in the form of an occasional, almost lazy, snare hit that later transformed into some jazzy ride cymbal action. At this point in the concert, the bass was so prominent that it was drowning out the other ranges of sound, but the problem was fixed by the middle of the next song. After a couple more tracks off Colour in Anything, Blake said he was going to play “a remix I did a long time ago” of a “dubstep producer from before EDM,” as in Untold and his song “Stop What You’re Doing,” released in the olden days of 2009, to “try to recreate that feeling” immediately preceding the metaphorical and historical drop. What followed was a live rendition of dubstep in its original form with a mixture of guitar, synths, live drums, and drum machines. It was a rare and cherishable experience to hear this kind of electronic music fleshed out and played live. Finally, this spurred the Arlington crowd to their feet and began moving down the aisles in a slow, controlled fashion, until they reached a security guard stolidly standing against the stage in each aisle, their features silhouettes against the band’s bright stage lights. Most who were standing stayed standing. Next was a stunning rendition of his and Beyoncé’s collaborative tune “Forward,” off Lemonade, where Blake pleadingly sang “I love you more than this job/Forward/Please don’t work for me.” The song had the feel of a cozy night spent sitting in your bedroom and brought on a feeling of childlike joy and comfort. As the opening chords of “I Need a Forest Fire” rung out, an image of a modulating sphere within the confines of a cube appeared on the back screen. As the song progressed, Blake sang Bon Iver’s vocal part more expressively than Iver on the recording. The sphere and cube reappeared, torn apart into ripped fragments. The camera zoomed in closer on the remains to reveal they resembled human features, congruent with the song’s themes of destruction, though not with the renewal it’s supposed to cause. The uplifting chorus of “Retrograde,” Blake’s most popular song, was accompanied by overwhelming, full-screen flashes of orange light over distorted keyboards, and felt like a revival in itself. The image of the familiar wandering light made its way through a black, transparent planet, before exploding into the aforementioned light, and then dimming again to show the celestial orb in its natural darkness, with a swarm of butterflies circling around it. Before the song reached peak intensity, Blake looped hummed vocals to harmonize and sing over, and accidentally caught cheers from audience members excited to hear him perform the track. Their enthusiasm was repeated every iteration of the loop for the entire song. It fit in with the music pretty well too. However, for his last song, “Measurements,” Blake requested that people be quiet for its duration, since it consisted of him looping the same vocal part over and over again, then playing them directly over each other, multiplying the copies of his voice exponentially each time. It was a sensitive operation for a sensitive song. The crowd conceded, and the resulting harmonies were the richest Blake sung that night, with a strong gospel influence, accompanied by a bass-like synth part that mostly copied the vocals’ rhythmic patterns. It was an intimate and inspiring end to a fulfilling, memorable show. As Blake left the stage, his fading keyboards transitioned perfectly into the after-show playlist.